Overwatch’s Winter Wonderland event will return in 2018 – as expected – and Blizzard has revealed the start date for this year’s round of wintry fun, as well as a preview of some new map decorations you can expect to see among the festivities. Naturally there’ll be plenty of new skins and other fun stuff when the event begins, and we’ll get previews heading into the launch. Winter Wonderland 2018 will begin on December 11 – precisely one week from the time of this story – and will last for three weeks before concluding on January 2. 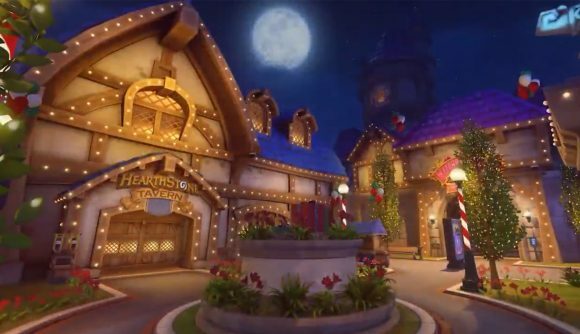 The one thing we know for sure about the event is that we’ll be playing on a redecorated, nighttime version of Blizzard World. There are loads of Christmas lights and holiday flowers, though sadly not a drop of snow. You can expect past winter skins to return along with some new ones, and while Blizzard hasn’t officially unveiled anything officially just yet, there are some hints about what to expect. A Blizzcon-exclusive Christmas shirt showcased previous winter skins for Zenyatta and Widowmaker, as well as an as-yet-unseen look that casts Junkrat as The Nutcracker’s Rat King. As Dexerto notes, it’s a very likely preview of what’s coming in this event. It’s a safe bet that Yeti Hunt will return during this year’s event with some likely expansions, but any other special brawls are a topic of pure speculation. If you’ve been out of the loop on the game lately, get caught up Overwatch’s v1.31 patch notes and Ashe’s abilities. Blizzard’s hero shooter continues trucking along, and continued seasonal events are one fun way of keeping interest running strong. We’ll see more of what to expect from this year’s version of Winter Wonderland over the coming week.